It’s been 21 years since I made my first investment on January 1st 1996. At the time I was 10 years old. Not your standard primary school hobby. I was sport obsessed and starting to realise girls weren’t as annoying as I thought, but for some reason I quickly became fascinated by what made share prices go up and down. 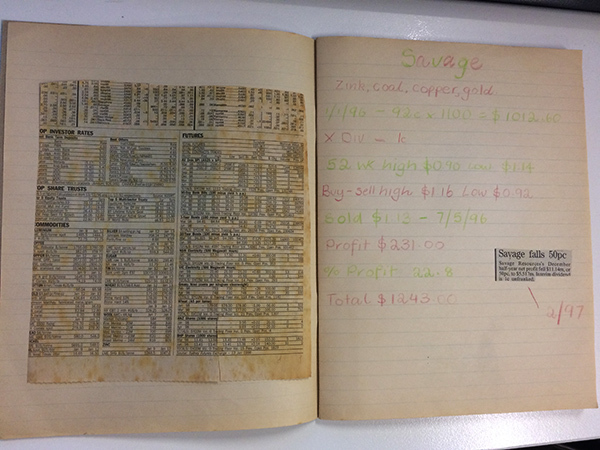 Neither of my parents worked in finance but I was lucky that my dad had some shares in his self managed super fund and decided to teach me and my brother some of the basics. He let us choose a stock from the newspaper and gave us $1,000 (which later, to my dismay, I found out was only theoretical). I had a few stock market wins, a few losses and I was hooked! 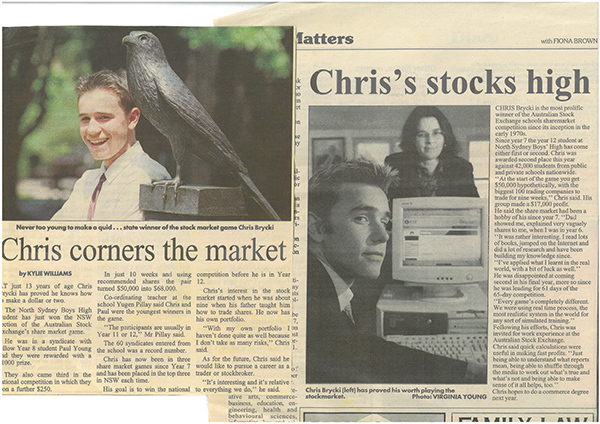 Armed with a taste for trading, I entered the ASX Schools Share Game each year between 1999 and 2003 and was lucky enough to win it 3 times up against 40,000 students from around Australia. The game only lasted 8 weeks and I quickly learned that to win it you needed to pick volatile stocks and trade them aggressively – this wasn’t investing, this was speculation. 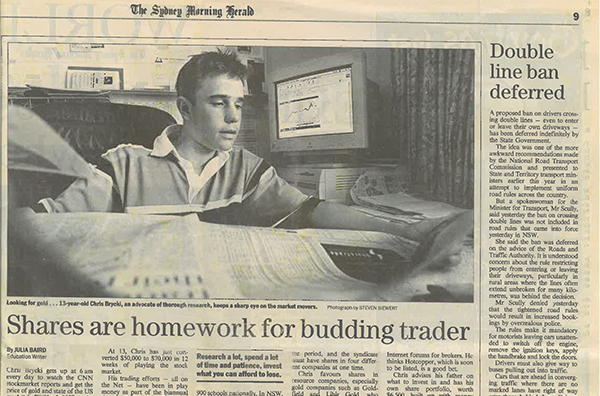 Naturally I decided to study accounting and finance at university – studying at UNSW. I then had the fortune of spending time at a successful hedge fund and then at UBS managing the bank’s proprietary investment portfolio. I’ve learnt many valuable lessons in my 20 odd years of investing in shares. These are the 10 most poignant that made the biggest impact on how I look at markets and investing for the long term. These lessons have also shaped the philosophy of Stockspot- the investment firm I founded in 2013 to help Australians invest smarter. It’s important to note that these are lessons on true long term investing – short term trading and speculation come with a very different set of rules, which I’ll share another time. 1. The inexperienced tend to attribute profits to skill and losses to bad luck. Charles Darwin wrote in 1871 that “ignorance more frequently begets confidence than does knowledge” (ie. a little knowledge can be a very dangerous thing for an investor). When one of my early investments, Ashton Diamonds was taken over for 4x my purchase price in 2000, I wrongly assumed this was due to my superior stock picking ability rather than luck. I was suffering from the Dunning-Kruger Effect – the name given to an illusory superiority in which unskilled people mistakenly rate their ability much higher than average. Years later I learned that many of the wins I had in my early years were entirely due to luck. As a young kid I had no advantage or edge over the market in working out which shares were going to go up or down. Many first time investors fall for the same costly illusion. These days since there are so many professionals scouring markets for opportunities, picking individual stocks is an endeavour almost entirely decided by luck. If you’re investing in direct shares always ask yourself “What advantage do I have over the thousands of others analysing and investing in stocks for a living”. If you don’t have an edge (99% of people don’t) you really shouldn’t be buying individual shares because over the long run you are likely to lose out against the professionals and be weighed down by costs. Instead you can beat even the majority of professionals by using the collective knowledge of the market and investing in an index fund or ETF that tracks all shares. 2. Approach investment hype with extreme caution. Markets move in cycles; sectors become hot and then fall back to earth. This has happened since the start of time and repeated like clockwork ever since. Bubbles can be a great opportunity to make money, but for most people they become a very easy way to give it away. I started investing during the first internet bubble so this was a lesson I learned early in my career. I was holding onto several speculative shares that had transformed into internet businesses. When the tech bubble music stopped abruptly in March 2000, their share prices crumbled. One of them was eMitch (EMI) an online advertising business which crashed from over $3 to under 3c in a year. What it taught me was to not chase the sector de jour regardless of your long-term view. I was positive on the adoption of online advertising but my timing was terrible. When you chase a hot sector, regardless of what happens in the long term, you’re unlikely to have the stomach (or pockets) to be able to hold onto it when the hype deflates. As economist John Maynard Keynes once said ‘The market can stay irrational longer than you can stay solvent’. I’ve learned from experience that markets can be irrational both to the upside (bubble) and then downside (bust). eMitch (renamed Mitchell Communications) did eventually recover to $1.50 by 2007 but by that time I had cut my losses. The people who made the most money from eMitch were the ones who saw an opportunity when the tech bubble crashed in 2001-2002 – not the ones who (like me) bought when the sector was most hyped in 1999. Investing in the most talked about stock or sector is a strong temptation. But sectors inevitably come in and out of favour in cycles. Rather than chase what’s hot, be the one who can pick up the pieces and find bargains when others are giving up on the sector later. 3. The best investment lessons come from losing money. Like in love, the best investment lessons I’ve learned have came from losing. Fortunately over 20 years I’ve had my fair share of ugly investments to learn from! Plenty of investors will gloat about their wins. Much fewer will talk about their losses and what they learned from them. Make that the first question you ask anyone pitching to manage your money. When have you lost money investing and what have you learned? 4. Buy straw hats in winter. You can skew the probabilities in your favour by looking where others aren’t. People find this hard to do because it’s counterintuitive – they feel more comfortable chasing momentum by investing in what has done well rather than going against the crowd. This is a core philosophy of Stockspot. When assets are doing well, we lighten them in our client portfolios and tip the funds into assets which have done poorly. 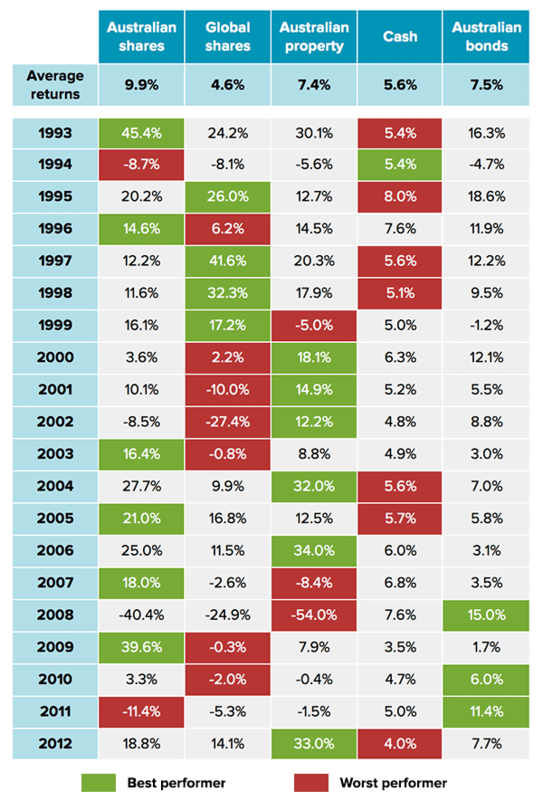 We do this because returns tend to revert to their long term averages over time so trimming good performers and buying laggards is a sensible strategy. As the table below shows, the worst performing asset in one year often becomes the best performer in the next and vice versa. Research by Vanguard shows that over time this is a proven way to reduce your risk. 5. Don’t try and pick turning points. For a long term investor, there’s little point trying to pick market turning points. Stocks, sectors and even markets only cross over their true ‘intrinsic’ value for very brief moments and can stay irrational (i.e. too expensive or too cheap) for very long periods of time. Expecting stocks to ‘revert’ to their ‘fair value’ is futile because that can take months, years or decades, or never happen. Rather than bet on when shares are too cheap or expensive, spread your risk, size your investment so you can withstand big moves in any direction and diligently rebalance when markets have big swings. 6. Dollar cost average. Dollar cost average. Dollar cost average. Markets can go up and down over the short-term and it’s almost impossible to pick the market top or bottom. So when is a good time to invest? Instead of trying to time your entry point, dollar-cost averaging is the best strategy I’ve found to invest gradually over a few days, weeks or months. Investing regularly over time in this way helps reduce the impact of short term moves in the market because you invest at an ‘average’ price over a period of time. It can also help overcome the temptation to stop investing when markets are falling, which many people do because we naturally try and avoid risk. In retrospect, falling markets are the best time to be buying and by dollar cost averaging you can take advantage when others are panicking. 7. Learn to distinguish smart investing from smart marketing. The professional investment industry generally gives investors whatever’s easiest to sell rather than what’s good for clients. This pet hate of mine is why fund managers and research providers are constantly churning out new products and research to suit whatever the flavour of the month might be. This is also why the investment advice industry is broken in Australia – because most people making recommendations have relationships with products via commissions, brokerage or stamping arrangements which creates an incentive to sell rather than to be a true professional and give good advice. Most new products are in areas where there has been strong recent performance because that’s usually where the demand is. Internet floats at the peak of 2000, mining floats at the peak of 2010. ‘Feed the ducks while they’re quacking’ so the saying goes. Recently it has been dividend funds, property funds and US technology funds because that’s where the best recent performance has been. However investing in the stocks or sectors with the best recent performance is a strategy lined with skeletons. 8. Costs are your investment enemy. The lower the fee you pay to the seller of investment services (your broker, adviser or fund manager), the more money there is left for you. Every dollar you pay in commissions, funds management fees, adviser fees, subscription fees or brokerage come directly out of your returns. Fund managers as a group have average performance over the long run, so paying them large fees destroys your long term earning potential. 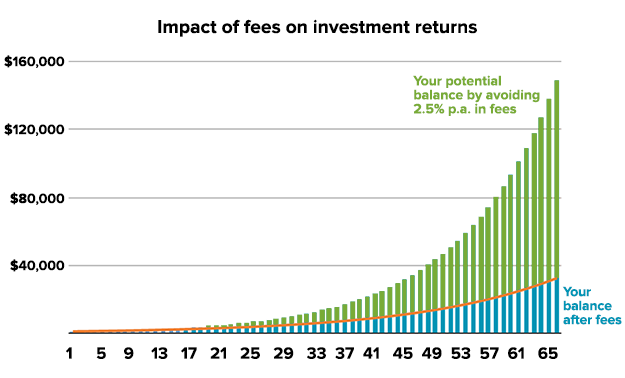 Paying 2.5% in costs each year will mean that 75% of your potential returns are paid to the funds industry over your lifetime! Keeping your costs low is key to investment success. 9. Most shares underperform the index. The maths of the stock market may surprise you. According to research from J.P. Morgan, the median share in the broad US Russell 3000 Index underperformed the overall index by almost 100 percentage points from 1980 to 2014. In other words, two-thirds of stocks in the index underperformed the market index over that period. 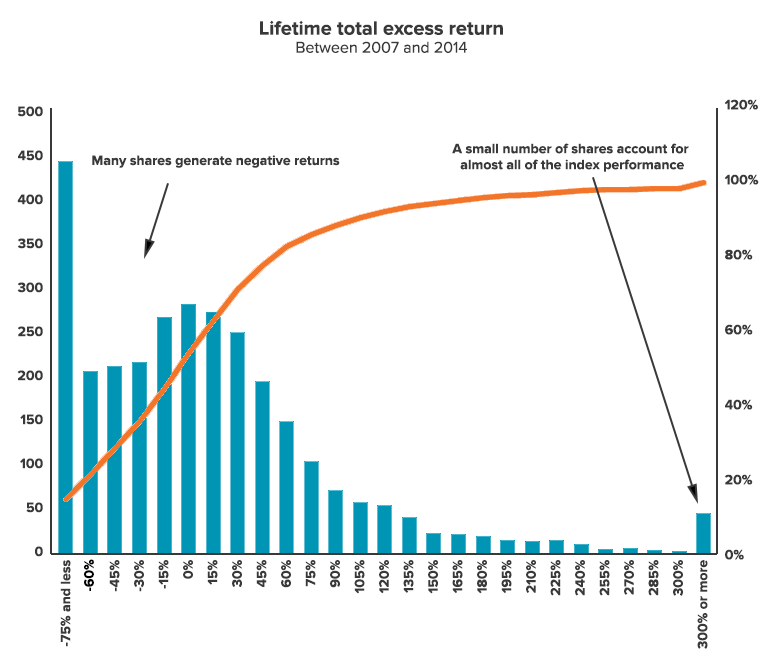 The huge majority of overall index returns came from less than 7% of shares. In other words, if you pick a share at random (which most people do) it will probably lag the market. This is why picking stocks is such a bad idea. It’s almost impossible to keep up with the market if you don’t own the small handful of stocks that drive most of the market’s returns. That handful of shares is always changing too – over the past 5 years it’s been Apple, Google, Facebook and Amazon. In the 90s in the US it was Dell, Lucent, Pfizer and Walmart. Unless you’re one of the fraction of 1% of people who can consistently pick the right stocks, owning the entire market via an index fund or ETF is the smartest way of earning consistent returns and not miss these stocks. 10. The best advice is boring. So called market experts on TV and in the papers really have no idea what’s going to happen next – whether that’s today, tomorrow or in a year’s time. Unless they’re looking 3, 5 or 10 years out, it’s basically a flip of a coin if they’ll be right or wrong on any particular call. Which is why most years the school student beats the analysts, economists and expert stock pickers in guessing where the market is going this year. 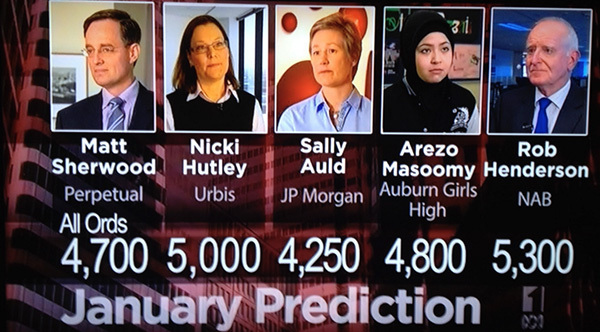 2013 market predictions, some of these experts were wrong by over 20%. People who listen to market experts either have very short memories, or they just love to hear a good yarn (after-all they are entertaining). In any case, the best investment advice rarely gets onto the news because it’s boring and makes it hard for most people in the finance industry to justify their jobs selling new stuff. That advice is, invest in a broad mix of assets, don’t pick individual stocks, keep your costs low, rebalance occasionally and don’t stress about what happens in the short term because it’s all just noise. That’s my best advice and core to our investment philosophy at Stockspot.